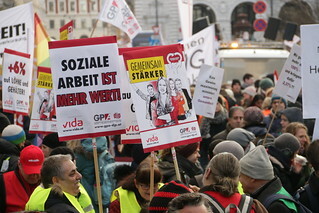 Founded in 1945, the Austrian Trade Union Federation (ÖGB) is the only Austrian organization representing the interests of workers based on voluntary membership. The ÖGB is non-partisan although in its efforts to achieve its goals, it does influence politics. The ÖGB has a major function in the development of new laws: it initiates the drafting of bills and provides political reviews of and comments on bills submitted by other bodies which are then incorporated in the decision-making process. Trade union members are entitled to legal advice and legal representation in court as well as many other benefits. They profit from the host of collective agreements negotiated by the ÖGB trade unions at industry level. This dense network of collective agreement, which benefits all blue- and white-collar workers in Austria, regulates, i.a., working hours, holiday and Christmas bonuses, overtime compensation, etc. Annual wage and salary increases are also covered by collective agreements. Activities carried out at company and industry levels are reserved mostly to trade unions which negotiate wage increases, assist works council members in elections, legal issues and other concerns.